Cloud is a powerful combination of cloud computing, networking, storage, management solutions and business applications that facilitate IT and consumer service. We are experts in native and cross-cloud application development and offers all the services necessary to build applications, including database, virtualization and architecture services easily and uniformly. Cloud application development: Leverage the cloud for application development to enable agility, speed-to-market and cost savings. Cloud Data management and analytics: Proper data management can reduce errors, lower operating costs and mitigate risk. 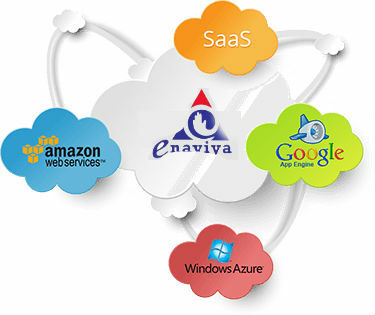 Enaviya helps organizations approach data management in an integrated way, creating a foundation for analytics that can improve risk assessment and management, as well as demonstrate compliance with regulatory requirements. Custom cloud application development and migration: Develop custom applications that leverage cloud application infrastructure and migrate legacy applications to cloud architectures. Cloud integration: Solutions services for cloud-based integration technologies for integrating data regardless of where applications are deployed.